Making over $100k and looking for a job? How do you compete in today�s job market where every advertised job may well have 1,000 resumes chasing it? �Turbocharged Networking for $100K+ Jobs� is a must-have book for today�s highly competitive, Internet-enabled job search environment. Packed with specific strategies and techniques that executives need to fine-tune their advanced networking skills, it gives you the tools you need to get your next great job. �Turbocharged Networking for $100K+ Jobs� tells clients how to get a job using the method that is successful about 80% of the time, as opposed to the 3% success rate of responding to online ads and going through executive recruiters. Learn the secrets to getting a job today. Discover ways to develop a target company list, how to use social networking sites, methods for gaining access to decision makers, sample telephone scripts to use, ideas for your sales pitch, and ways to become a valuable resource to hiring authorities as their next hire. Jean Cummings is an executive resume consultant and career coach. She distills complex careers into simple value propositions and success stories that are then integrated into powerful executive resumes and LinkedIn profiles. Ms. Cummings provides job search best practices to clients through her eBook and through her coaching. 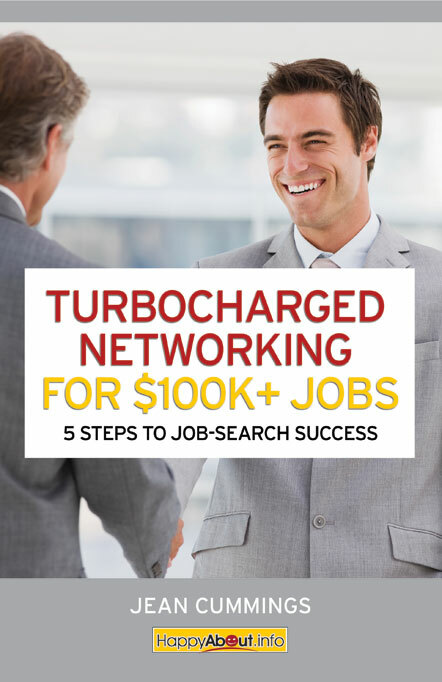 The Turbocharged Networking for $100K+ Jobs Bundle includes the eBook and a training session with the author, Jean Cummings, M.A.T., CPBS, CPRW, CEIP. This combination ensures that you will know everything you need to know as a six-figure earner about getting a job in this competitive job market. 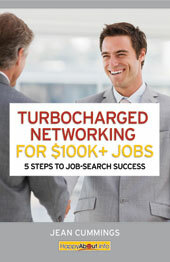 The eBook, 'Turbocharged Networking for $100K+ Jobs -- 5 Steps to Job Search Success' explains in detail how to go about the new networking, in which you take control of the process, connect with many contacts you don�t know as well as many you do, and conduct a "consultative networking" campaign that results in job offers and/or valuable referrals. The accompanying training is a broad job search strategy development session in which you map out with Jean your entire job search campaign and then walk through the path-breaking networking methods described in Turbocharged Networking for $100K+ Jobs � 5 Steps to Job Search Success. Executives and high wage earners need to job search in a sophisticated way that matches their seniority and level of accomplishment. During the training session, you will learn whether or not to post your resume online, use executive recruiters, and respond to posted ads. You will also learn about creative ways to use direct mail campaigns and take advantage of social networking sites and other online methods to raise your visibility. And, most importantly, you will learn how advanced networking techniques can lead to valuable job offers at the companies of your choice. Networking training takes you through the five steps of turbocharged networking. It is called "Turbocharged" because it is like networking on steroids. It is not confined to contacting family, friends, and colleagues. And the turbocharged networking campaign is not conducted in the random, "put yourself out there and see what happens" method that networking is usually considered to be. First, you�ll learn how identify your target market, that is the companies you want to work for. Secondly, you will practice doing company research. Thirdly, you will develop your presentation, that is, what you will want to communicate to a hiring authority that will grab their attention and get you an offer and/or referrals. Next you will learn to navigate the tricky process of gaining access to decision makers. Finally, you will learn the secrets to success in conducting a consultative networking meeting, which is as different as night from day from going to a traditional "job interview." With the difficulty high wage earners are experiencing with getting their next job, you can't afford not to develop a sophisticated job search campaign dominated by the method that is successful 80% of the time: turbocharged networking. The eBook plus strategy training session is the one-two punch that will energize your job search and set you up for success. Jean Cummings is a career consultant who specializes in helping executives, managers and professionals in technology land their next positions. She distills complex careers into high-impact executive resumes and branding documents. Her job search and interview training offerings give clients the tools they need to attract and negotiate job offers. She also works with clients specifically on eliciting and expressing their personal brands. Jean has a master�s degree from Harvard University and graduated Phi Beta Kappa from Mt. Holyoke College with a bachelor�s degree in Philosophy. After her education, Jean was employed as a teacher and tutor of moderate special needs children. For the past 15 years, she has owned and operated her company, A Resume For Today, LLC in Concord, MA and on the web. Jean is known for bringing intelligence and creativity to the products and services that she offers. She is an award-winning Certified Professional Resume Writer, Certified Employment Interview Professional, and Certified Personal Branding Strategist.